(Marietta, OH, July 10, 2018) Caron is pleased to announce the new gBrite family of LED-powered plant growth chambers. Available in standard full-spectrum white, or optional and infinitely adjustable 4-color, these units provide unrivaled experimental flexibility. gBrite uniquely allows you to modify your spectral mix on a shelf-by-shelf basis, for as many as three independent light zones per chamber. “With Caron’s implementation of new LED technology, plant researchers now have more experimental options than ever before”, commented Steve Keiser, Caron President & CEO. “Whether you’re adding blue light for enhanced beta-carotene production, varying the red to far-red ratio to alter plant heights, or just want to reduce radiant heat and lower plant stress, the gBrite series offers a configuration to fit your needs”. Ease of use is also improved, with an available full-length viewing window with a natural light viewing option that makes plants easy to see, even when using difficult to visualize blue or red-heavy color mixes. As always, Caron builds these chambers to be facility-friendly. 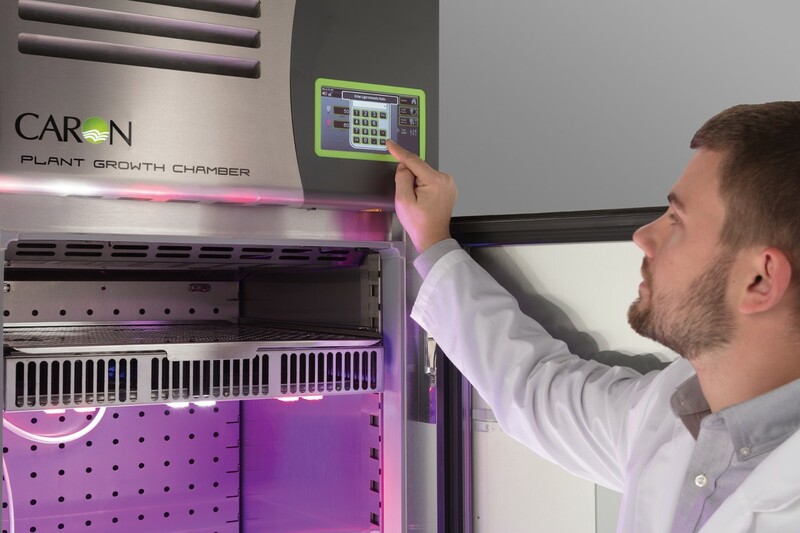 Standard electrical line cords, 3-minute interior removal, energy-saving gROD refrigeration on demand, and easy to use touchscreen controls combine to simplify user and facility requirements. To learn more about the 7310 series gBrite chambers, visit www.caronproducts.com or contact customer service at 800-648-3042 or email .